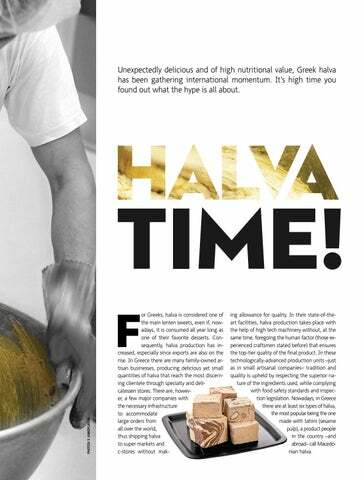 Unexpectedly delicious and of high nutritional value, Greek halva has been gathering international momentum. It’s high time you found out what the hype is all about. ing allowance for quality. In their state-of-theart facilities, halva production takes place with the help of high tech machinery without, at the same time, foregoing the human factor (those experienced craftsmen stated before) that ensures the top-tier quality of the final product. In these technologically-advanced production units –just as in small artisanal companies– tradition and quality is upheld by respecting the superior nature of the ingredients used, while complying with food safety standards and inspection legislation. Nowadays, in Greece there are at least six types of halva, the most popular being the one made with tahini (sesame pulp), a product people in the country –and abroad– call Macedonian halva.